My website is very detailed, more detailed than the websites of any of the other candidates. I write them [my positions on jobs/green new deal, global warming, Syria, Social Security, etc] myself. I research them myself. I talk a people. I get input. I check the facts. And then I put it out there. So that shows a work ethic. That's what you're going to get if you put me in Congress, a congressperson who works hard deciding the issues. And in order for voters to appreciate that, they also have to have a work ethic. They have to read it, and see if they agree or disagree. I think everyone will agree that I've spent a lot of time thinking this through, whether they like my ideas or not, they will appreciate that I've given it considerable attention. That's the kind of attention I will give if I am elected. Enbridge's Line 5: "The pipeline has to go. It has to come out, not to be replaced, not to be modernized or improved, but just eliminated altogether." Despite my considerable efforts to educate the public, Republican Jack Bergman has replaced climate-change denier Dan Benishek as the representative of Michigan's first congressional district. Bergman -- a surprise plurality winner of the Republican primary and in my opinion a lightweight -- won an absolute 55% majority. I received 4774 votes, a little over 1%. I deeply appreciate these voters, as well as the work of everyone who has advocated for the issues seen on this site. The spiritual US Taxpayers and Natural Law parties did not participate this year. Greens and Libertarians together got 5.05%. Libertarian Diane Bostow scored nearly three times as many votes as I, repeating a disparity seen in my last three congressional runs. Unlike the Libertarian in 2014 Bostow appeared at the forums and campaigned actively. I wasn't impressed by her website and she has no interest in mobilizing for climate change, but she had a nice manner on the stage which came across to audiences. She is the cousin of Libertarian presidential candidate Gary Johnson, whom the Detroit News endorsed. For comparison, in 2014, with four candidates running, I got 2631 votes or 1.1%. The two minor parties in total got 2.6%. Republican Dan Benishek won with a majority, 52.1%. Democrat Jerry Cannon got 45.3%. In 2012, a presidential year with high voter participation and four candidates running, I got 4171 votes or 1.2%. The two minor parties in total got 4.3%. Republican Dan Benishek won with a plurality not a majority, 48.1%. Democrat Gary McDowell, with 1881 fewer votes, got 47.6%. In 2010, a mid-term election with six candidates running, I got 2072 votes or .9%. Three minor parties got 3.8% and Tea Party Independent Glenn Wilson got 3.4%. Benishek won an absolute majority, with 51.9%. In the Democratic primary this year, Lon Johnson had overwhelmed Cannon by almost 3-1. Puzzlingly though, in the general election he did worse than Cannon in 2014, who himself did worse than McDowell in 2012. Of the three I thought Johnson was the best, given his positions on issues (particularly compared to Cannon) and diligence in campaigning. This, compared to the winner Bergman, who skipped several candidate forums. It reached point that on October 26 I emailed his campaign about his absences, pleading that he attend the two remaining forums so voters would have a chance to evaluate. Bergman had credibility problems. One centered on his refusal to discuss his own national security strategy despite repeated criticisms by him of Obama for not having one. At a forum on October 28, pressed for the reason he wouldn't talk, he claimed to hold a current national security clearance. And he refused to name his sponsoring agency. He had been out of the Marines for nearly seven years, and since then had worked only as a commercial pilot and in the medical equipment field, hardly positions which would require a clearance. His home and love of Louisiana and dislike of snow were also a problem, since he was running in a district where, as he told a Louisiana reporter when he left the Marines in 2009, there is "10 feet" of it in winter. 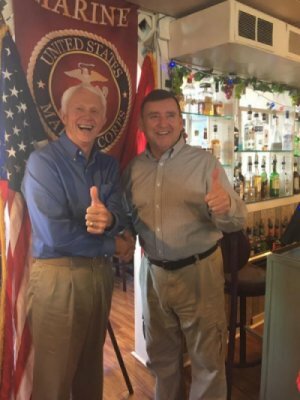 ConservativeIntel: "MI1 Update: Progressives Fume Over Lon Johnson Investments in Enbridge as Democrat Jerry Cannon and Republican Jack Bergman Appear Together in Kalkaska"
An unsigned news item from ConservativeIntel appeared two days before the election which may have been a factor in Bergman's win. The piece was so surprising that I wondered if it might have been fake. It featured an undated picture of Cannon and him posing in Kalkaska with convivial thumbs-up signs before a banner celebrating the birthday of the Marines. There wasn't an explicit quote by Cannon endorsing Bergman, but the picture gave that impression. Accompanying text denounced Johnson for hypocrisy in investing in a fund which owns shares of Enbridge, the owner of Line 5. It's hard to believe that Cannon, who would have opposed Bergman had he won the Democratic primary, posed with him in the week before the election. For myself, state county-by-county results show my highest totals (over 200) in order were in Grand Traverse, Marquette, Emmet, Charlevoix, and Houghton. Counties where my percentage exceeded my average in order were Charlevoix, Emmet, Grand Traverse, Leelanau, Alger, Gogebic, Kalkaska, Antrim, Benzie, Houghton, Marquette, and Mason. OpenSecrets reports that outside groups spent about $5.2 million for and against the combined candidates, none of which came in during the last week of the campaign. Bergman raised and spent about $1.3 million, Johnson $2.0 million, and Bostow $6 thousand. I raised and spent close to $0. A review of the major positions of the other candidates is here. 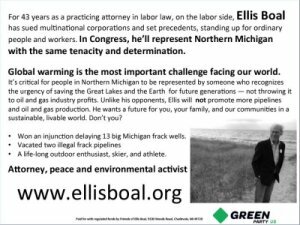 In summer of 2015 I had received an unexpected invitation from Leonard Page, a longtime friend/adversary, Democratic activist, and former Clinton-appointed NLRB general counsel, to a northern Michigan Democratic Party fundraiser coming up at the UAW's Black lake Conference Center in Onaway. I had seen him a few weeks earlier at a talk about Line 5 after which we had a drink. Page had been one of the Democrats most angered in 2014 by my revelations about Cannon's involvement in torture in 2004 when he headed detention at Guantánamo Bay. But my mission at the Line 5 lecture was not about partisan politics. It was collection of signatures for the frack-ban initiative. I got thousands that summer. Expecting the frack measure would be on the 2016 ballot my plan at the time was not to run for office again and rather spend full time working for the measure's passage. So not being a threat at the time, Page was happy to invite me to the event as his guest, where contending candidates for different offices, including Johnson and Cannon, appealed to their comrades for support. During the event, separately Page and Johnson each introduced me to the crowd and invited people to sign my sheets. I was thrilled. Page had made a point to the crowd that I would not be running in 2016. By this time I was nervous whether we would make the ballot that year. So before leaving I told him my decision not to run was contingent on the ballot measure succeeding. Later after the election he told me had he known I would consider running again if the ballot measure failed, he would not have paid my way in. I don't recall that we had detailed discussion of the point when he had given me the ticket, but in any event I e for the confusion. The following spring I saw Johnson again at a Sanders rally in Traverse City. He asked my plans. I again committed to not running if the initiative made the 2016 ballot. June 1, 2016, was the deadline for filing initiative signatures for the 2016 ballot. On that date we had only 207,000, which was 45,000 short. We decided to keep on collecting, now for the 2018 ballot, and sue to set aside the state's 180-day time limit for getting signatures. Ultimately we lost the suit, not on the merits but on the ground that the constitutional issue wasn't yet ripe. We are considering our options of what to do next, but that's another story. I would rather we had collected enough signatures or won the lawsuit. But the court loss freed me to run again in the first congressional district. On July 31 the state party nominated me. On August 16 as a courtesy, I emailed Johnson and Page to let them know. Johnson did not return the favor, referring repeatedly in candidate forums to "my opponent" (singular) without noticing there were more than two candidates. responses to voter-guide questions of Between The Lines, Detroit Free Press, Gongwer, League of Women Voters, Mining Journal, MLive, Project Vote Smart, and VoterAid. I declined responses to questionnaires from the Michigan Family forum and US Chamber of Commerce. The Sierra Club endorsed Johnson in February before he won the Democratic primary. a campaign facebook page (though I don't do facebook myself). 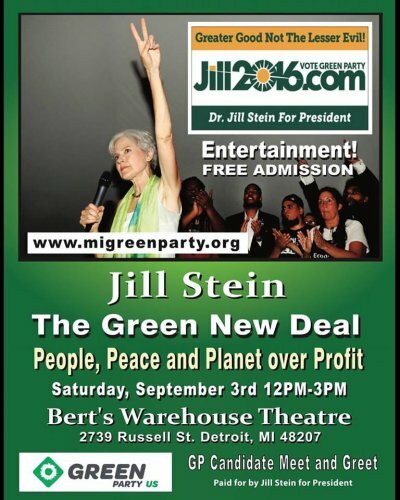 Special mention should be made of the C-Span-captured appearances of Green presidential candidate Jill Stein and vice-presidential candidate Ajamu Baraka at a Michigan Green Party candidate rally at Bert's Marketplace at Detroit's Eastern Market, the Saturday of Labor Day weekend. Singers Martha Reeves, Al Chisholm, DJ Holiday, and Polly Taylor were on hand, joined by Lynwood Colquitt (trumpet), Gerard Evans (sax), Vaughn Klugh (guitar), Glenn Oliver (bass), Butter Hawkins (drums), Michael Horner (congas/bongos) and Bill Meyer (keyboard). Called by Reeves to the mike at the end of her set to play congas on "Dancing In The Street," Stein electrified the house at the start of her talk. Baraka also spoke movingly. As he told the event organizer, my wife LuAnne Kozma, when he returned to Michigan in October it set a "high bar" for the whole national campaign. Baraka came to an assembly at Renaissance High School and a lecture at Wayne State University in Detroit on October 18 and then to an event at Nandi's Café in Highland Park. On October 19 he was in Flint and Grand Rapids. The same day he also visited political prisoner Edward Pinkney at a correctional facility in Muskegon. Stein was originally scheduled to return here on October 28, but had to regret due to recovering from pneumonia. Elsewhere in Michigan, after four tries longtime Traverse Bay Watershed Green Party organizer Tom Mair won the spot for Grand Traverse County Commissioner District 2, overcoming the 10-year Republican incumbent by 53%. There was no Democrat in the race. Frequently I am asked if I am concerned my candidacy could take votes away from Democratic candidates and result in a Republican victory. Is a vote for a Green "wasted"? The year 2012 is an example. Republican Benishek won only by a plurality. Democrat McDowell was short by just 1881 votes or .5%. Of course, the question would be better asked of Libertarian Emily Salvette that year, who got 10,630 votes or 3.1%. I got only 4,168 or 1.2%. Also to be considered is that some people may not have voted at all had Salvette or I not been in the race. So the question calls for speculation. Even so it's not implausible that half of my votes might have gone to McDowell and put him over the top had I not run. And McDowell -- even though he advocated expanding US production of oil and natural gas, was anti-choice and pro-official English, and was a patsy for the failed crackpot terrorism-insurer Sovereign Deed -- did not have the horrific torture problems that Cannon had in 2014. This leads to my direct answer. First of course is that an election is not just about winners and losers. It is about public discussion of the issues, a discussion which advances democracy. Second, the Green Party is not the left wing of the Democratic Party. It has its own principles and structure which are quite different from the Democrats'. For example we would not nominate someone who is anti-choice. We would not nominate someone involved in torture. The Party's principles are elaborated here and here. That is, our whole purpose is to take votes from the other parties including the Democrats. We also want votes from disillusioned people who at present don't vote at all. Greens have to start somewhere. 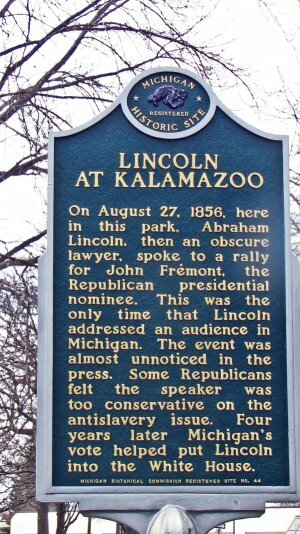 Abraham Lincoln did the same in Kalamazoo in 1856. Eventually we hope to convince the voters to our view and implement our policies. We have a long way to go to fix things. But right now, Greens are the only party that is even trying. Two issues arose in the immediate aftermath of the campaign, the first one being very positive. Right after their Detroit appearance on Labor Day weekend, Stein and Baraka traveled to Standing Rock, North Dakota, to stand in solidarity with Sioux tribal members and other natives and water protectors to oppose the Dakota Access Pipeline (DAPL). 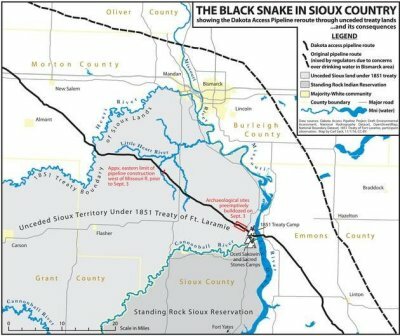 The 30-inch line was to carry 500,000 barrels a day of volatile fracked crude oil 1168 miles from northwest North Dakota to refineries and terminals in Illinois. Without tribal permission it would cross 38 miles of unceded Sioux land under an 1851 treaty and exit at the treaty land's eastern border, the Missouri River as widened by artificial Lake Oahe. We are here in a Native American venue and I assume that at least in Cabinet meetings you have had contact with the issue of conflict between Israel and the Palestinians. What differences and what similarities do you see between the resistance of Native Americans to the establishment and the policies of the United States, and the resistance of Palestinians to the establishment and the policies of Israel? In particular, how would you compare the justness of the causes of Native Americans and Palestinians, and their methods of resistance? He refused to answer and resigned two weeks later. I have long pondered this question. 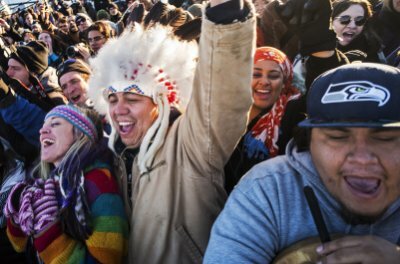 To see if we could get answers, and inspired by the national outpouring of support for the tribes, LuAnne and I decided to go to Standing Rock after the election. The October 28 LSSU forum. Starting at counter 1:16:41 is my response to the question about Standing Rock. A question about the pipeline fight had come from the audience toward the end of the October 28 forum at LSSU in Sault Ste. Marie. I announced our trip, said I would be doing volunteer legal work there, and invited anyone in the audience to come along. We started driving the Saturday after the election, arrived the next night, and set up our tent at Oceti Sakowin (Seven Council Fires) Camp. Every morning at 6:00 am a call and songs would go out from the sacred fire to the thousands of "relatives" in the camp -- tribal warriors and allies -- awakening and summoning us to breakfast and to action. The first duty for newcomers was to attend the orientation to camp life. By then there had been some 500 arrests, including of Stein and Baraka. LuAnne is a paralegal. We worked in the water protector legal tent that week under Angela Bibens, helping to interview arrestees, potential arrestees, and witnesses, and organize the cabinets filled with growing numbers of files. One evening after documenting a protector, I escorted him to the medical tent for treatment of his taser barb wounds. Another night the whole tent was cleared of files and people and the stove, so carpenters could come in and install a wood floor; LuAnne and I and Skyler were assigned for a couple of hours to guard the most critical files still in the tent. Twice I drove to court, once bringing a tribal Cheyenne River activist for his arraignment. Patiently in the car he explained the cultural issues, frustrating on both sides, which arise even when a white and an Indian are just talking. In the courtroom I marveled at a native defendant who objected to the court's jurisdiction because the incident arose on 1851 tribal treaty land, and a white defendant who protested police racism in alleging more serious charges against native Americans than against him, for the same conduct. I was present when a local judge on her own motion threw out the first dozen of more than 100 conspiracy felonies for an occupation in the path of the not-yet-built pipeline. 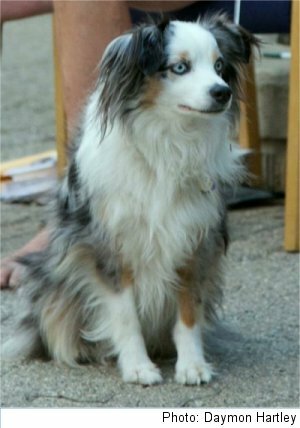 We stayed at the camp five days. The day we arrived home there were 100 more arrests at Backwater Bridge, when police fired water cannon at water protectors in freezing weather. A week later the North Dakota governor and the Army announced eviction orders effective December 5. Expecting a new wave of arrests, I decided to go back. This time I traveled with a carpenter friend, Stephen Brede. On arrival he went straight to work helping to build composting toilets for the winter weather. By that time the legal tent had plenty of lawyers and law students. So I let them know I was available if there were any emergency. Then I spent the week in the camp kitchen. I served food, hauled firewood, and washed pots at first, and then worked my way up, encountering another old friend on the way. At the end, I cracked 400 breakfast eggs one day and browned the buffalo meat. I was at the sacred fire on December 4, celebrating when the Army unexpectedly announced a temporary reprieve. Estimates of the size of the camps at various times varied. Actually there were three camps -- Oceti Sakowin, Rosebud, and Sacred Stone -- clustered on the Cannon Ball River. I believe the largest they got in sum was 10,000 or close to it, over Thanksgiving, the largest native gathering since the battle of the Little Bighorn (known to plains Indians as the Battle of the Greasy Grass), or since the encampment at the negotiation of the 1851 treaty. The last night, the wind chill gusted down to -15° F. The tent next to us blew down. Walking against the wind was difficult. Once walking alone in the dark, I fell in a snowbank. The interstate was closed across all of North Dakota but we finally managed to get out. The celebration at the sacred fire was short-lived. At this writing the fire is out and Oceti Sakowin abandoned. DAPL has announced the pipeline is complete and oil has started to flow. The tribes are still continuing the legal fight. Curiously in court, with one exception that I know of, they are placing but little reliance on the 1851 treaty, though there was extensive discussion of the treaty in the camps. In effect, most of the litigation accepts the racist "discovery doctrine," according to which title to indigenous tribal lands lies with a government whose subjects travelled to and occupied it, since the people already there were not subjects of a European Christian monarch. The US supreme court upheld the doctrine in 1823. The discovery doctrine is out of step with imperative norms of international law dating from the late 19th century. In 2005 the supreme court noted but did not specifically approve it. Unceded Sioux territory (light grey) under the 1851 treaty, 38 miles of which is crossed by the DAPL line (in solid black). One thing which comes clear in the study of this is that an insult to Sioux sovereignty even greater than DAPL took place with the construction of the dam which created Lake Oahe in 1958. The new lake flooded more Indian land than any other public works project in America -- 56,000 acres -- and forced relocation of hundreds of tribal families. The Standing Rock Tribe successfully sued to stop the dam in 1958, but Congress found a way around the judge. The dam was completed a year later. Today for the Sioux the outlook is grim. But there are indications the fight may have ignited a string of other pipeline protests around the country. The second aftermath issue was demoralizing. Two weeks after the election, on November 23 Stein petitioned for recounts in Michigan, Pennsylvania, and Wisconsin because of anomalies in the outcomes. Having lost these states narrowly and having the same evidence before her, Clinton had declined recounts, though a change in the winner of all of them would have given her the presidency. According to a brief Stein filed in the Michigan federal court, there is evidence that foreign hackers broke into email systems of Democratic Party operatives. There is evidence that hackers broke into voter registration systems and stole data from Illinois and Arizona. There is evidence that hackers attempted to do the same in other states not including these three. There is evidence that these three would have been logical hacker targets. But for Stein and the Green Party, anomalies in these three states were no more important than in other states. And why did she hire a lawyer prominently tied to the Democrats to lead the Michigan challenge? And why would the same brief cite the "Russian government" and "foreign cyberattackers" who can "spread vote-stealing malware to every voting machine in the area," and link them to "large-scale hacking" of optical scan machines "possibly to change the results"? Yes, such hacking could have happened. But Stein presented no evidence to suggest it actually did happen. She went to the Green Party of the US for administrative assistance in collecting contributions from large donors and was refused. Likewise the Green Party of Michigan did not back her up. Baraka opposed the recount effort saying it would be "seen as carrying water for the Democrats." For the same reason some 327 Green Party supporters across the US signed a letter decrying the recount, insisting that the party remain independent and not ally itself with the Democrats (or Republicans), and urging that the Green Party build itself from the bottom up. Despite these problems, in just a few weeks Stein managed to raise over $7 million from over 160,000 individuals. The sum is twice as much as she collected during her own campaign. Stein ended the fundraising campaign in December. While the partial Michigan recount did unearth instances of improper ballot handling and possible voter fraud in Detroit, no indications of area-wide hacking of voting machines, or of any hacking at all, were uncovered. I am quite sure that the large bulk of the recount money came from Democrats not Greens. I am quite sure they were motivated by the hopeless hacking claim. She had waged an energetic and wide-ranging national campaign. I was proud to be associated with it, and proud of LuAnne for organizing events and directing volunteers in the Michigan part of it. But the recount effort was a blemish and a distraction. Fortunately it ended quickly. I hope the party can overcome it. This year I had two PayPal donations, $25 from Ann Hart in St. Ignace and $150 from Robert Jereski in New York. Expenses were $59.63 for printing the cards, $5.65 for PayPal fees, and driving mileage and toll expenses for the car donated by me. The one night I was on the road, October 27, I slept out at Fuller County Park south of Escanaba at no charge. Total expenses or contributions being under $5000, there was no need to file financial statements with the Federal Election Commission. Particularly I thank LuAnne who set up the campaign facebook page and designed the cards. 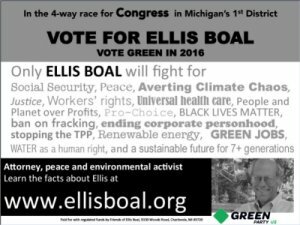 But by far her most important contribution -- even as she continued to direct the initiative campaign of the Committee to Ban Fracking in Michigan -- was as organizer of the Michigan Stein/Baraka campaign visits and coordinator of Michigan volunteers in sign distribution, phone-banking, and door-to-door campaigning.